Try Continuous Ink System with your Epson Expression Home XP-1000 and make 30 times more quality prints for the same money! Pay only 0.04 USD for A-4 full color print! Epson XP-100 CISS for home and office is a device very simple in use, with the help of which you save your savings at most. The most important element in the use of Continuous Ink Supply System is economy and the fact that Continuous Ink Supply System can use even a schoolchild or an elderly person, that's why you do need to worry that the device will be difficult in use. 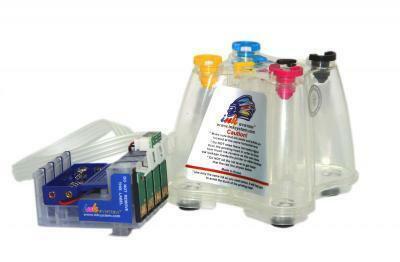 Continuous Ink Supply System is a modern alternative to the original cartridges for printing on your inkjet printing device. Everything you need is to order bulk ink system for Epson XP-100 or CISS Epson XP-102, and you will get the device that will allow you to economize on each copy. Using CISS for the printer of this model means to reduce expenses dozens of times, because you use the inkjet printing technology. Sale of CISS for the printer now is carried out online by means of our online store. In our online store you can also order CISS Epson XP-30. Do you know that cis Epson XP-100 will perfectly fit at most to print photographs and text files quickly and without any loss of quality? You may acquire CISS for the printer of this model thanks to our remarkable online store where you can find a variety of product for printing at a reasonable price. We want to notice that Continuous Ink Supply System has a number of advantages in comparison with the original cartridges. Firstly, we would like to mention that using ink system for Epson XP-100 for ink printing you will reduce your expenses on printing under 20-30 times. Secondly, you do not need to substitute cartridges when the ink finishes. 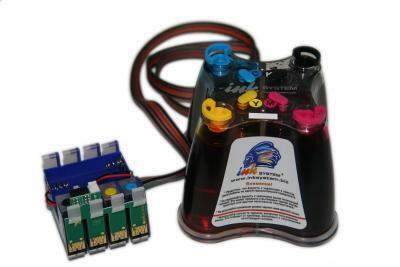 Now you can add very easy the ink of necessary color to a special tank. Thirdly, you can 100% be sure that buying continuous ink system Epson XP-100 you get a very reliable device. Reliability of this CISS is achieved thanks to the fact that it has a factory assembly which is carried out at a modern factory in South Korea. You can buy a presented device at any time using our site. At first you have to choose an appropriate model of CISS. Acquire a chosen model will help you a comfortable catalogue in navigation, which is presented on our site. If you have questions according to the device, you can call using the mentioned numbers and our attentive managers will consult you. Buy CISS and print quickly, qualitatively and with pleasure!